After almost 17,000 kilometers of travel since the start of the tour, we have arrived back in the Bavarian state capital. Fortunately for the team, Official Logistics Partner DHL makes sure that our equipment - more than 2,000 kilos of it - always gets to appearances, events, training sessions and games in good time. But at some point, sadly, every trip comes to an end. Even the most enjoyable ones. 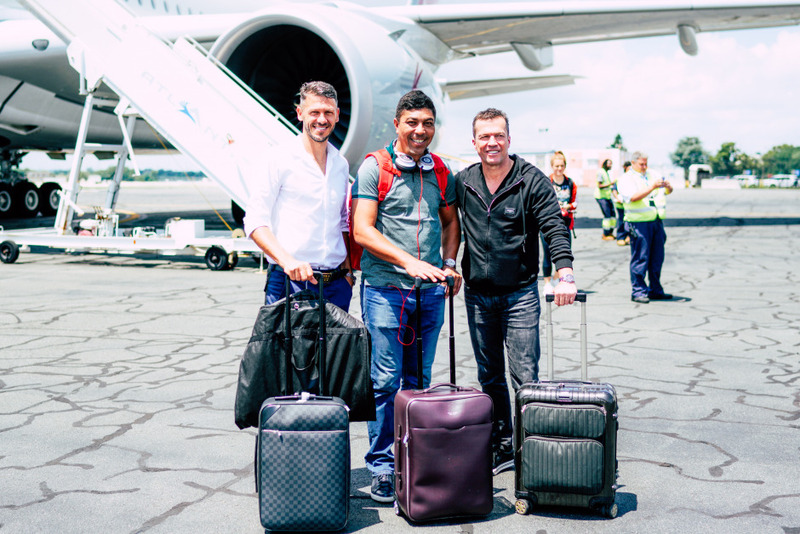 The good news is that the 2018 Audi Summer Tour 2018 was once again a fantastic experience for the players, for the organizers and above all (of course) for thousands of fans and members of our Global Family. While the players get used to being back home in Munich, you the fans still have the opportunity to enter another of our competitions. And if you're not already a member of our Global Family, then why not join now? Sign up here, for free, and get the chance to win an original match-worn jersey. 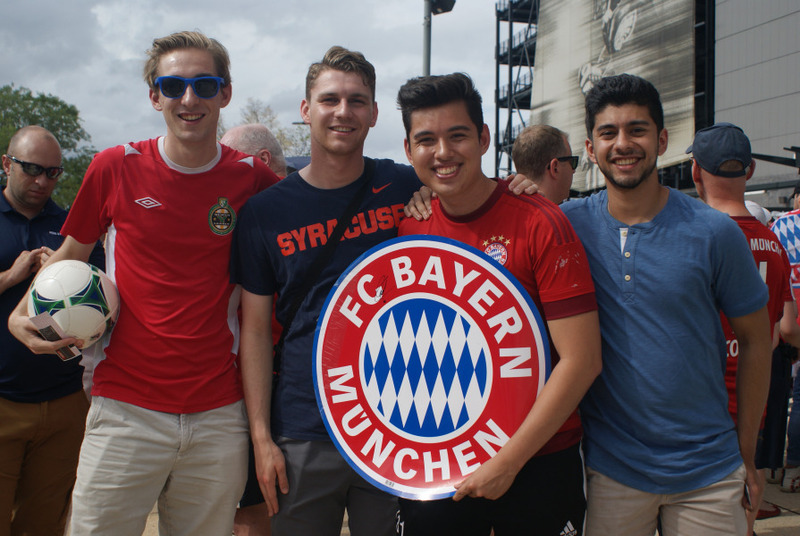 And please remember to invite your friends and acquaintances to become part of the FC Bayern Global Family, too. 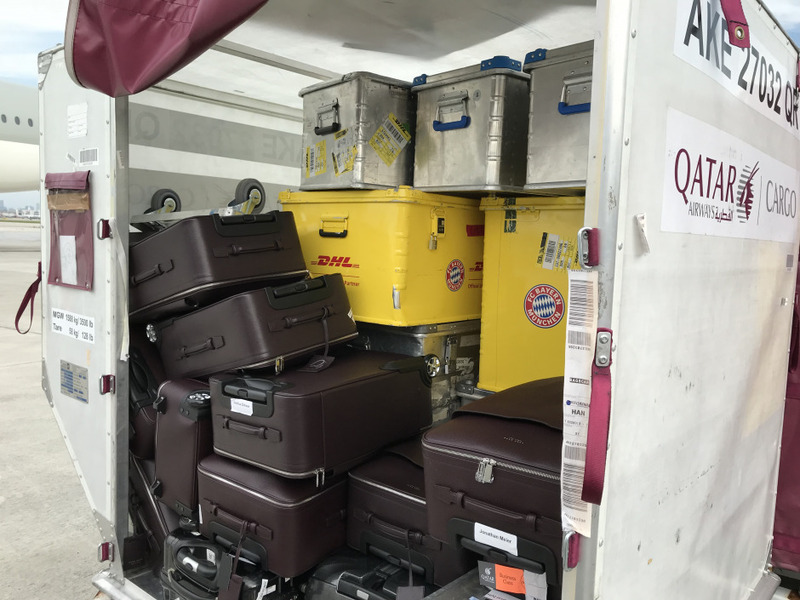 The players have obviously had to train hard on the US tour, so DHL in its role as Official Logistics Partner brought along gym equipment weighing 295 kilos. However, spin bikes were not included. DHL to the rescue! 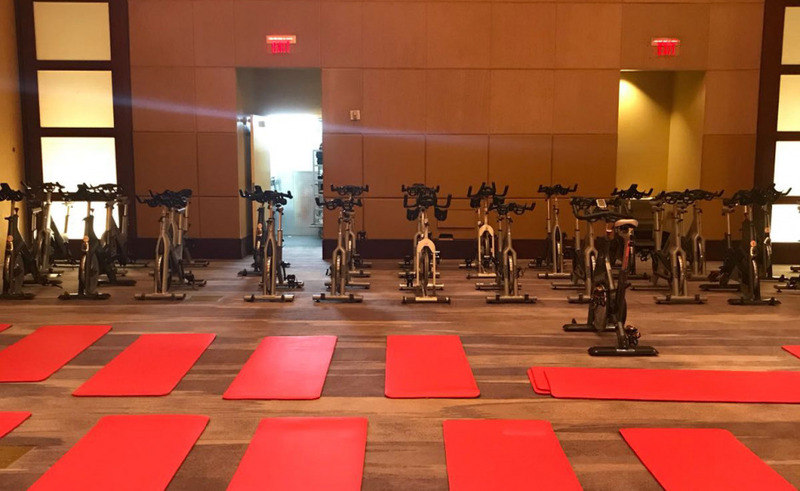 Our Kit Van Team from DHL Trade Fairs & Events stepped into the breach at very short notice, ferrying 25 of these training bikes from Barry University to the team hotel in Miami. So far so good. But the bikes had to be conveyed through the lobby to the ballroom on the first floor. No easy task, as spinning bikes are not only incredibly heavy but also do not roll easily over carpet. Our Kit Van Team probably ended up perspiring more than the players in the training session. It wasn't until midnight that our trusty crew were able to announce: Mission accomplished! If they had arrived earlier in the day, they would no doubt have been given a slice of the birthday cake that the Mayor of Miami delivered to the team, the birthday in this case being the 122nd of the city. 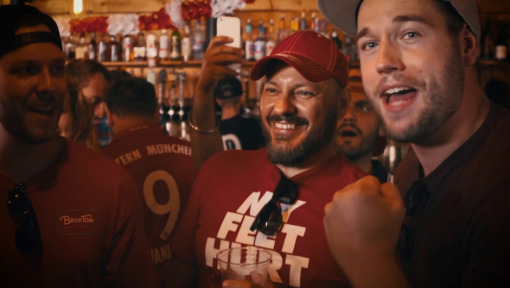 The guests from Munich were happy to join in the celebrations, varying the team motto on this occasion from "Mia San Mia" (We are who we are) to "Mia San Miami" (We are Miami). Meritan Shabani and Arjen Robben put FC Bayern 2-0 up with goals in the first half. But unfortunately, Manchester City then came back to win 2:3. Were you as spellbound by the action on the pitch as we were during yesterday's match? We bet you were. And we think you deserve the chance to be a winner. 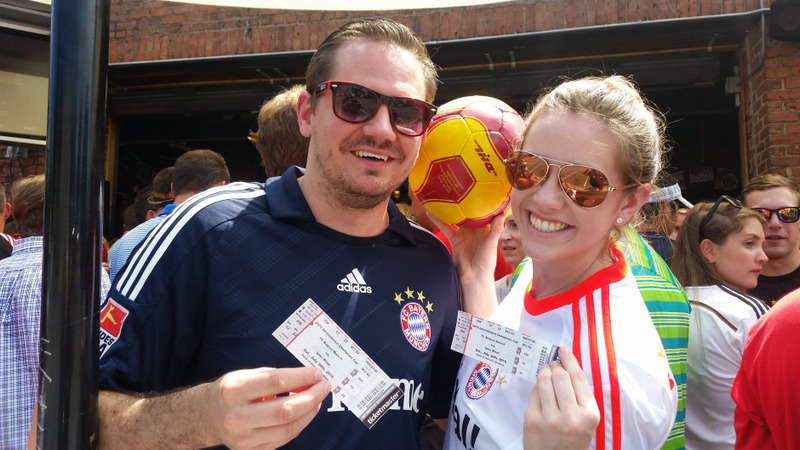 For the last time on this summer's tour, we are giving away an original jersey worn by one of the FC Bayern stars. 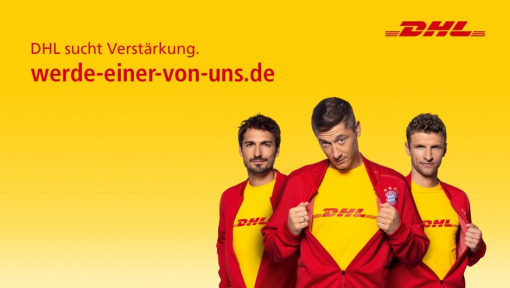 So get busy on your keyboard and enter our competition at www.dhl.com/FCBayern. 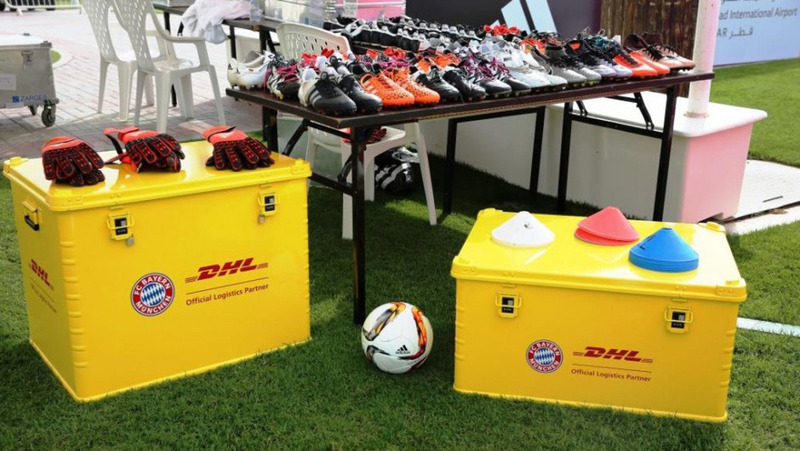 A warm welcome to the huge Global Family of DHL and FC Bayern awaits you. You will be joining more than 50,000 other members. Hi! We hope you slept well. We are really excited, because today's the day that the Audi Summer Tour 2018 comes to an end. And to round it off in style, we have tonight's game between FC Bayern and Manchester City at Hard Rock Stadium. For us, it will be a reunion with former FC Bayern coach Pep Guardiola. The Spaniard has been manager at the reigning English champions since 2016. The big match starts at 7pm local time. Keep your fingers crossed for FC Bayern! And, as usual, there is something for you fans to win today. 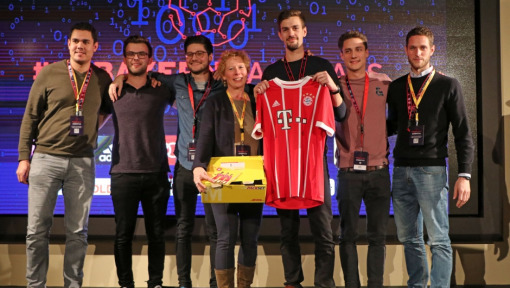 As with all matches played on the Summer Tour, DHL and FC Bayern are once again giving away an original jersey worn by one of the players as a prize for some lucky member of our Global Family. 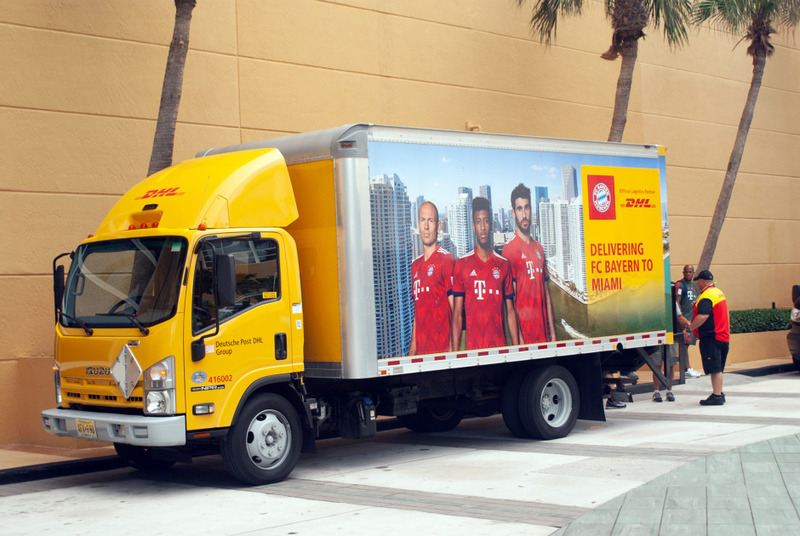 Did you know that DHL has transported a total 2,005 kilos of material for FC Bayern during the whole of the 2018 Audi Summer Tour? We've got a busy time ahead of us in Miami. On Friday, it's one event after another. We've got a five-a-side "Legends" match, several autograph-signings and a training session to fit in. The latter will take place at the Hard Rock Stadium which is also the venue for Saturday's game, the second of the tour, this time against Manchester City. The stadium has a capacity of 65,000 spectators and is home to the Miami Dolphins of the NFL. It has already hosted five Super Bowls. But for the past ten years, it has also been the home ground for the NCAA college football team Miami Hurricanes based at the University of Miami. Soccer has been played in the stadium on several previous occasions, for example in 2013 when it was one of 13 venues for the CONCACAF Gold Cup. And in 2017, two International Champions Cup games were played there: Paris Saint-Germain - Juventus (Score: 2-3) and Real Madrid - FC Barcelona (likewise 2-3). Training is taken as seriously as ever during the Audi Summer Tour. To ensure that the players are fit for the 2018/19 Bundesliga season, DHL has brought along 295 kilos of gym equipment. 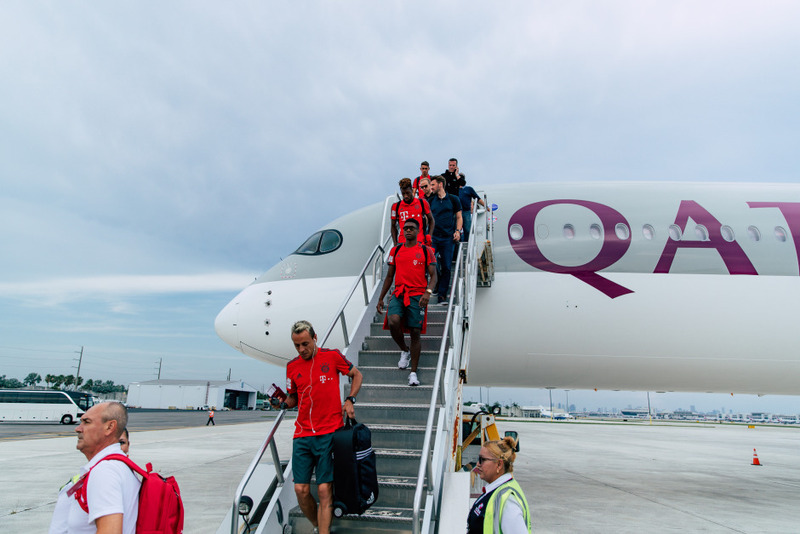 FC Bayern depart Philadelphia for Miami, the second destination on the 2018 Audi Summer Tour itinerary and 1,600 kilometers away as the crow flies. While the players are flying between the two American metropolises, don't forget that you can win an original jersey worn by one of the players in yesterday's game. What a great opportunity! Enter our competition at www.dhl.com/FCBayern. 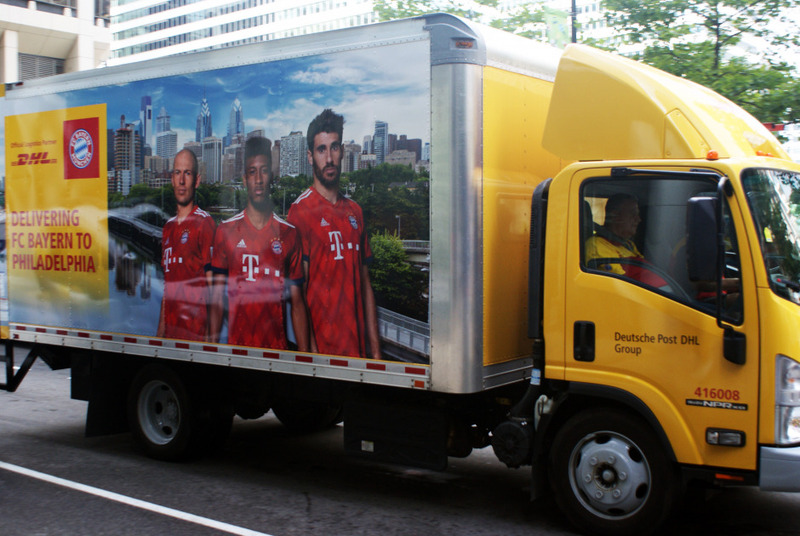 For FC Bayern and DHL, the US tour is very important. After all, it gives our Global Family members in North America the chance to see the FC Bayern stars live and maybe even add another autograph to their collection. The club has around 27 supporters' associations in the USA. 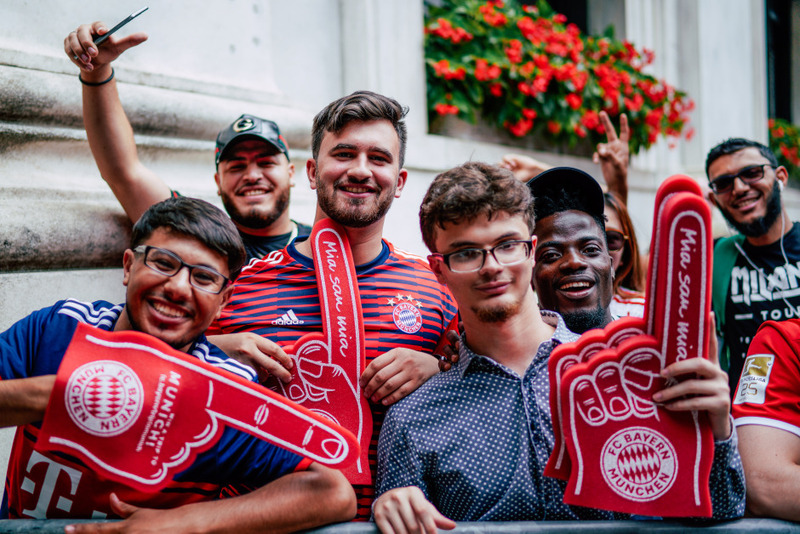 Since FC Bayern opened a dedicated US office in New York in 2014, the number of fan clubs in the US has increased to stand at 138 spread out over 39 federal states. By the way, the "Reds" and FC Dallas have had a twinning arrangement since February of this year. The two clubs work together to bring on their talented youngsters and share training philosophies. Teamwork always pays off. No ball? No game! 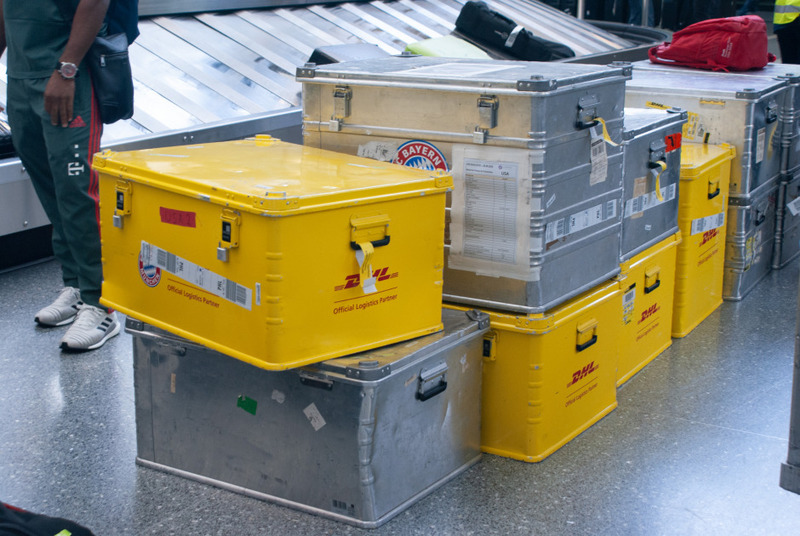 Did you know that, taken together, the footballs transported by DHL on the 2018 Audi Summer Tour weigh 115 kilos? The FC Bayern players had to cope with pouring rain on Wednesday evening in Philadelphia in the first game of their US tour. 32,105 enthusiastic spectators braved the inclement conditions together with the 22 players at the Lincoln Financial Field in a match that Bayern unfortunately lost to Juventus 2-0. Andrea Favilli scored the goals with a brace before the break (32nd and 40th minute). Ahead of tonight’s match in Philadelphia, Bayern announced a new signing. In 17-year-old Alphonso Davies, Munich’s top club has secured the services of a leading young talent in Major League Soccer (MLS). The Canadian teenager, who was born in Ghana, will make the move from Vancouver Whitecaps to FC Bayern on 1st January 2019. This fast and skillful attacking player has already been capped eight times for the Canadian senior side. Soon, he too will be a member of the big Global Family that is FC Bayern! On the subject of young talent, another teenager from North American has been training in Munich for several weeks now. 18-year-old central defender Chris Richards moved on loan from FC Dallas’s junior academy to the FC Bayern Campus, the club’s new center of excellence where future prospects are trained. Richards is the first exchange player to make the switch to Munich since the strategic partnership with FC Dallas was announced earlier this year. The exchange of young players and collaboration in the structuring of training sessions is intended to ease youngsters into a career in professional football. 🏆 CHAMPIONS! 🏆@FCBayern are the 2018 #ICCFutures winners! Incidentally, investing in the talent of tomorrow is already paying off. While the first team have just embarked on their US tour, the U15s of the record Bundesliga champions have just tasted success in the International Champions Cup Futures in Orlando, Florida. The FC Bayern youth team notched up a first tournament victory of the new season. Notable opponents included Atletico Madrid, Liverpool FC, FC Celtic and Borussia Dortmund. In the final, the team managed by Peter Wenninger beat Chelsea 3-1. Let’s hope the senior team can do just as well. The clock is ticking: FC Bayern will play Juventus in the first match of the US tour tonight. 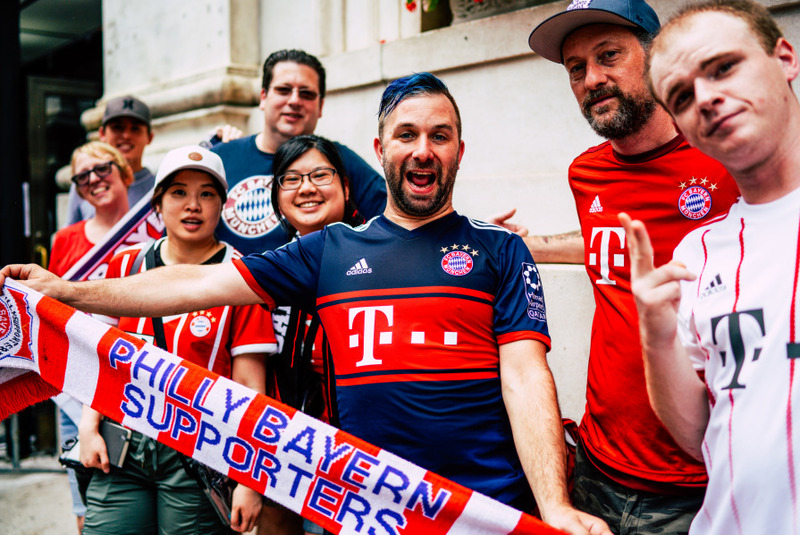 Fans gathering in the Fan Zone outside Lincoln Financial Field before kick-off at 7pm local time will find plenty to occupy their attention, but you too can be a winner with DHL and FC Bayern. After the game against Juventus we are giving away an original jersey worn by one of the FC Bayern stars. So what are you waiting for? Enter our competition at www.dhl.com/FCBayern. These two teams last met in March 2016 in the UEFA Champions League. 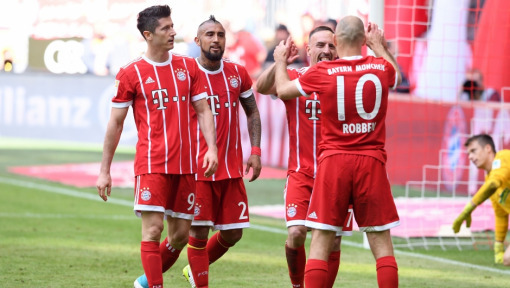 After a 2-2 draw in the away fixture in Turin, FC Bayern won the return match in a sold-out Allianz Arena by a score of 4-2 after extra time and progressed to the quarter-finals. The goals were scored by Robert Lewandowski, Thomas Müller, Thiago and Kingsley Coman. The players would be at a loss without tracksuits, jerseys, shorts and socks. 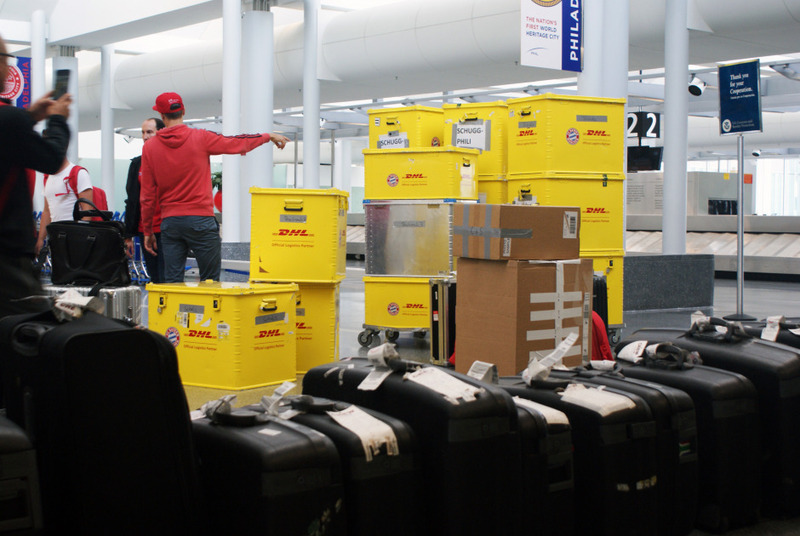 DHL brings 780 kilos of training and matchday kit to the USA. That's a lot of jerseys! "Hurra, hurra, die Bayern die sind da!" Hurrah, hurrah. The Bavarians are here! 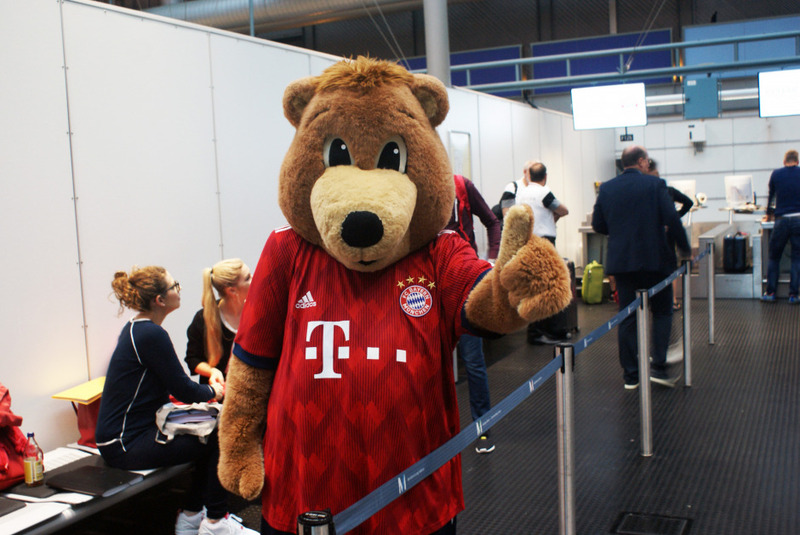 When the FC Bayern stars arrived at the airport in Philadelphia, they were met by an enthusiastic band of supporters. On Tuesday, activities step up a gear. 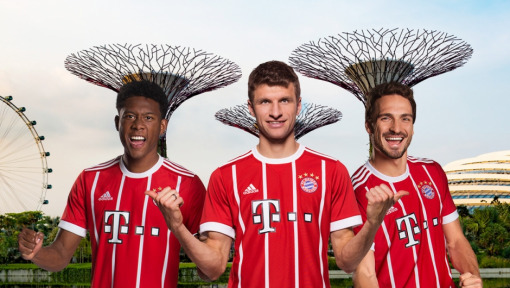 First, two FC Bayern legends will be putting in an appearance at an event in Dilworth Park; then between 5pm and 6pm local time, there will be a semi-public training session at Lincoln Financial Field. At 8pm, some of the players will be signing autographs at the T-Mobile Store (1201 Market St Suite 8, Philadelphia, PA 19107). A day like that on the Summer Tour can be quite exhausting. The US tour does not begin in earnest until Wednesday, when FC Bayern meet Juventus Turin, or La Vecchia Signora ("the Old Lady") as they are known in Italy. The game will be played at Lincoln Financial Field, an American football stadium that seats 69,000 spectators. The arena is usually home to the Philadelphia Eagles, but it has also hosted the Army Navy Games, lacrosse and Monster Truck events. Incidentally, FC Bayern and Juventus are not the first soccer teams to kick a spherical ball at Lincoln Financial Field. The stadium was inaugurated in August 2003 with a friendly match between Manchester United and FC Barcelona. Subsequently, the US national team, AC Milan, Chelsea and Real Madrid have all played on the turf of Lincoln Financial Field. The most important item of work equipment for the FC Bayern stars is of course their football boots. 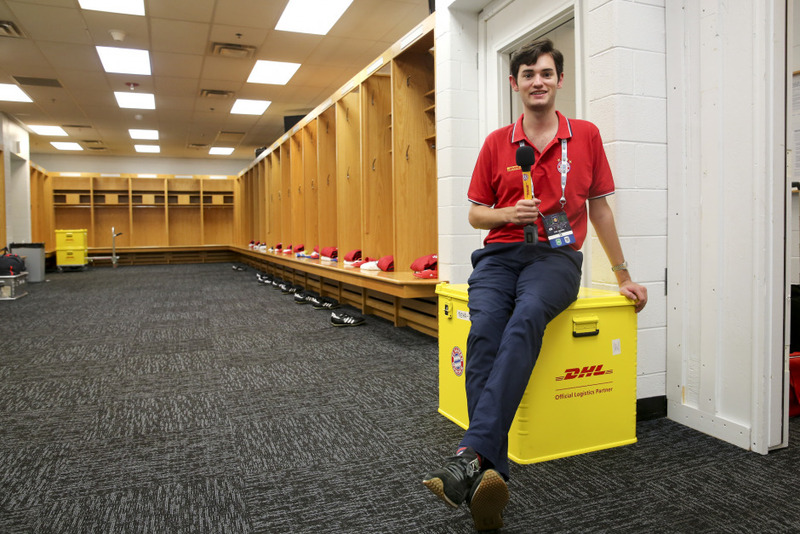 Did you know that DHL has transported 140 kg of training and matchday boots to the US? America, we're on our way. Today, we board our flight for Philadelphia. The last time FC Bayern visited the United States was in July/August 2016. On that occasion, the itinerary took in Chicago, Charlotte and New York. 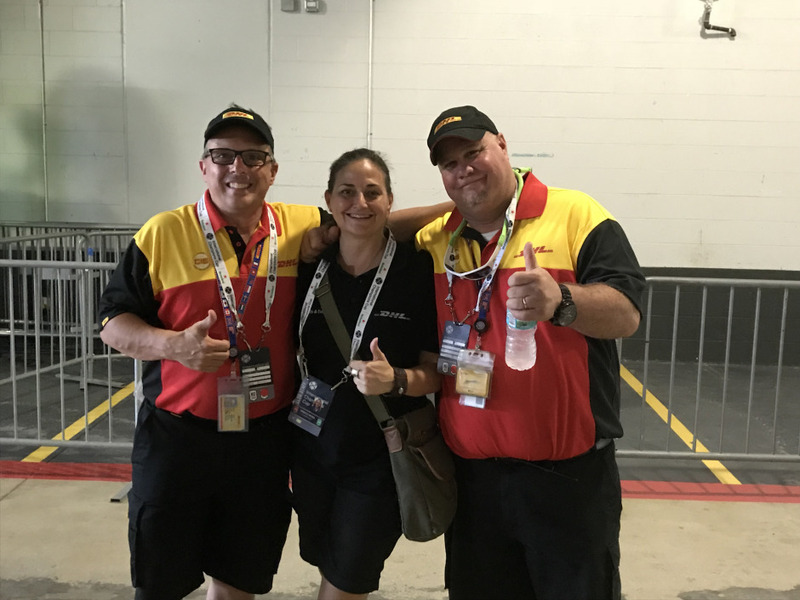 And of course, DHL was in attendance all the way as Official Logistics Partner, our main responsibility being the transport of team equipment. Perhaps you saw our DHL fan reporter videos from China and Singapore yesterday? We think it's the best possible way of getting in the mood for this year's tour. We hope you had as much fun watching these videos as our DHL fan reporters Scott, Matt and Jimmy had making them two years ago. Even we discovered a lot of things we wouldn't have otherwise known about FC Bayern and the Summer Tour from their backstage reports. Obviously, a journey of this duration with so many stops and so much freight has to be well planned in advance. Our infographic gives you some insight into the processes going on behind the scenes. 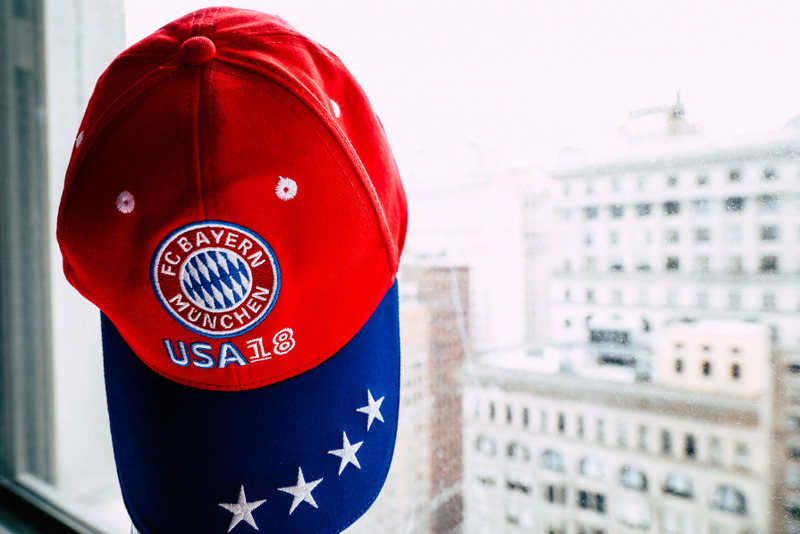 By the way, since the summer of 2014, FC Bayern has had a dedicated office in New York. We are a truly global family. It's begun. 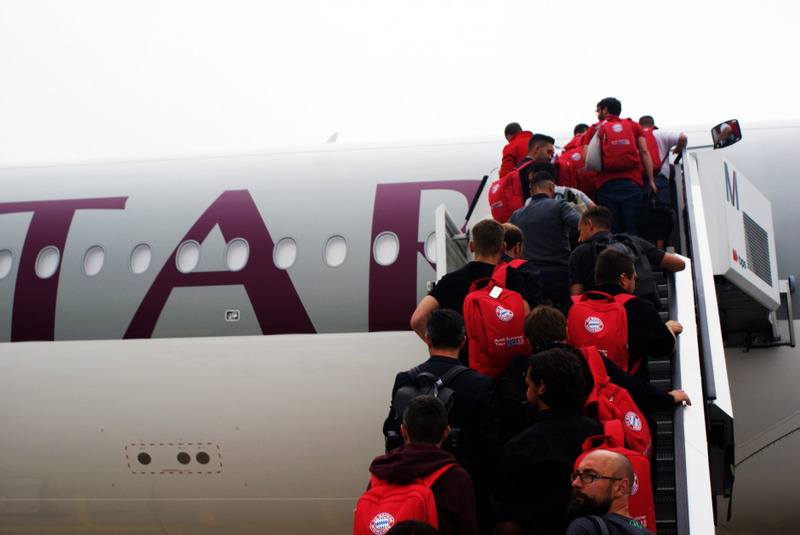 After yesterday's game against Paris, the team are getting ready for today's long-haul flight to the USA. While they are in the air, that should give you plenty of time to reread our 2017 DHL Fan Reporter Blog. It contains so many cool background stories about the logistics of the trip to Asia, about the presentation of the match ball and about the best fan moments involving various FC Bayern legends. And if you're still wanting more, then we have a very special treat for you, namely the daily video blogs from our DHL Fan Reporter. Let Even, Ji, Terry and Terence take you on a behind-the-scenes tour of FC Bayern. The time had finally come today for FC Bayern to play their first match of the new 2018/19 season in Klagenfurt. And what a terrific start they made! The Munich side were up against reigning French champions Paris Saint-Germain and managed to pull back strongly from an early deficit to turn the game around. FC Bayern won comfortably 3:1 after the 90-minute game. Two goals came from Javi Martinez and Renato Sanchez, who has recently returned to the team. Another goal was scored by young talent Joshua Zirkzee after new signing Serge Gnabry set him up brilliantly. What a magnificent start to the International Champions Cup by the record-breaking German champions! You're maybe wondering, what exactly is the International Champions Cup? It's quite simple really. The ICC is an international soccer tournament held every year since 2013 as the major leagues take their summer break. 18 teams from six top European leagues are taking part this year. England has the most teams in the competition with six clubs, followed by Italy with four, Spain with three and two from both France and Germany, plus one from Portugal. From the German Bundesliga, Borussia Dortmund are also taking part alongside FC Bayern. And how exactly does the International Champions Cup work? There are no group or knockout stages. Each of the 18 teams will play three matches, at the end of which an overall total winner is determined in a joint table. There are no ties in this tournament. There's a direct penalty shootout in the case of a draw after 90 minutes with no extra time allowed. However, the winning side only gets two and not three points for a win achieved on penalties. In the case of a tie on points after the three ICC matches, then the following rules for classification apply: Points, head-to-head points, goal difference, goals scored, points against a common opponent, the least number of red cards, the least number of yellow cards, the fewest fouls. If that's not enough to determine who wins, then a coin will be flipped to decide the overall winner just like in the good old days. Following the opening match here in Klagenfurt, FC Bayern will have two more matches this week in the International Champions Cup. They will play Juventus in Philadelphia and Manchester City in Miami. 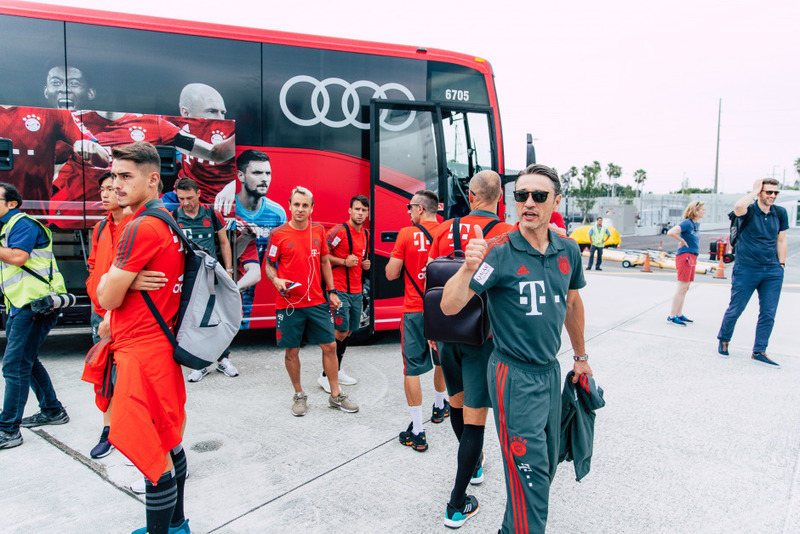 Before FC Bayern board the plane to the USA on Monday, the German record league champions will play their first preseason game within the framework of the International Champions Cup (ICC). Their opponents are none other than reigning French champions Paris Saint-Germain. This clash of the titans from the two respective leagues will take place at Klagenfurt in the idyllically beautiful Austrian province of Kärnten (Carinthia), 265 km as the crow flies from Munich. It will be the first competitive fixture for the team after the FIFA World Cup in Russia. The game will be played in the 30,000-capacity Wörthersee Stadium. Kick-off is at 15:30 CEST (live streaming to be provided by DAZN and live on German free tv channel Sport1). Calling all FC Bayern fans! The fun starts tomorrow when your favorite club sets off on a visit to members of our Global Family. Last summer, the team traveled to China and Singapore; this time, they are heading back to the land of limitless opportunity - to the USA! 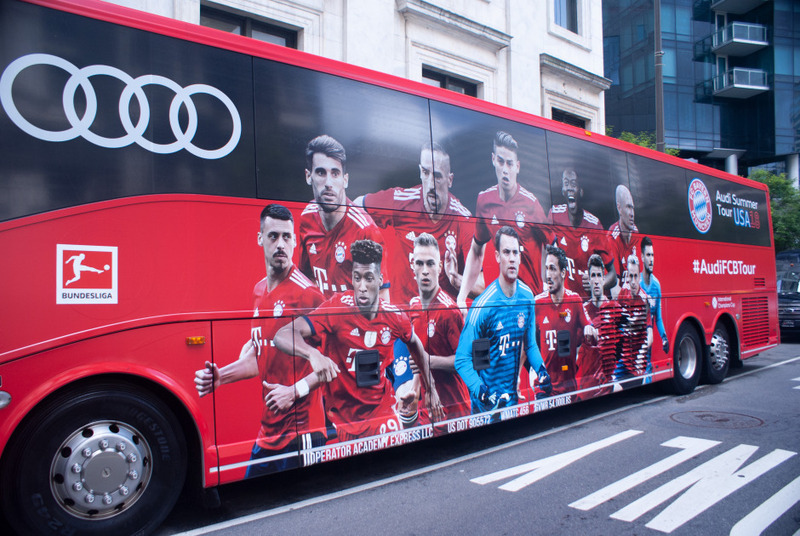 FC Bayern regard their now traditional Audi Summer Tour as an important way of giving fans around the world the opportunity to see the stars close up. 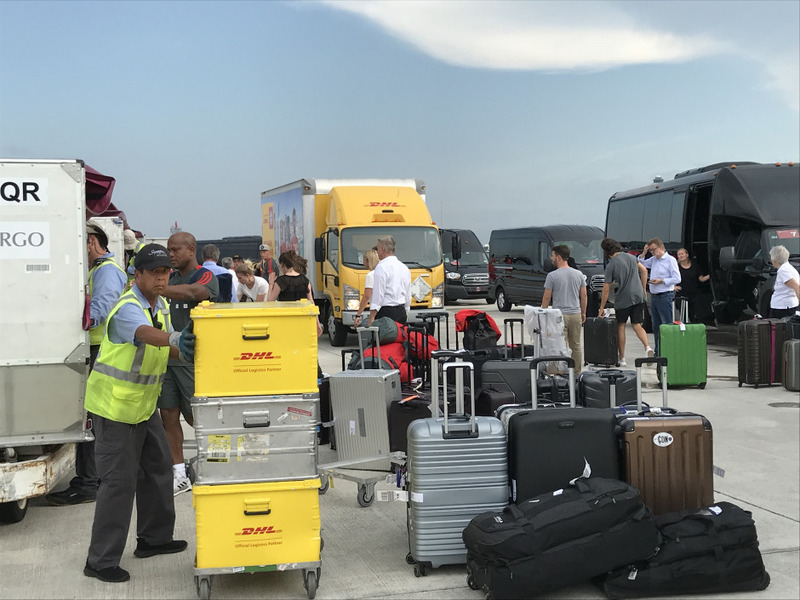 Whenever the club crosses the Big Pond with its players, equipment and, of course, plenty of autograph cards for enthusiastic fans, DHL as Official Logistics Partner has a vital role to play. 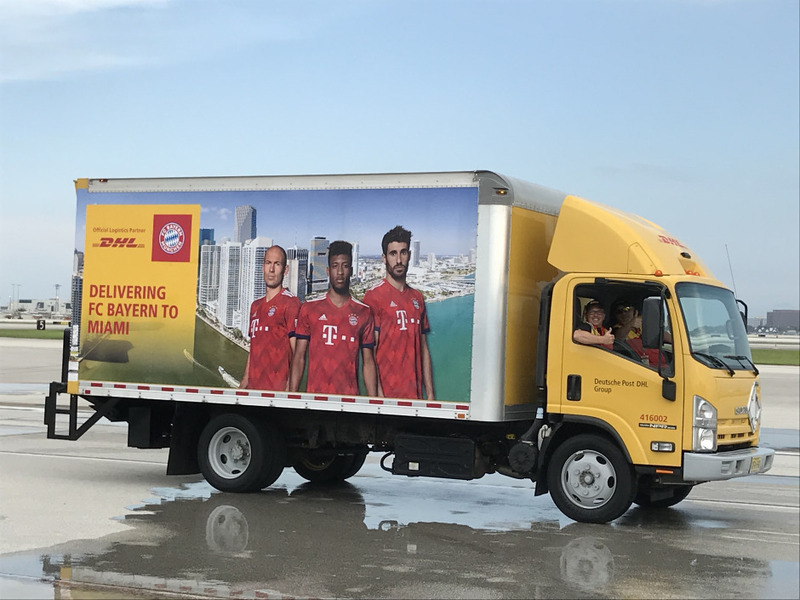 As in previous years, DHL will be accompanying Munich's top footballing outfit on its travels and using its global expertise to ensure that equipment arrives on time and ready for every training session and match on American turf. 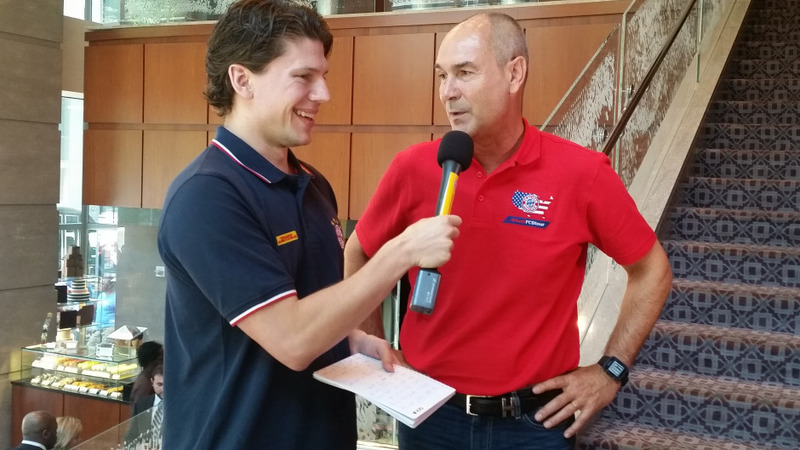 How much work is involved with this was revealed in last year's DHL Fan Reporter Blog. Our Fan reporters provided an exclusive glimpse behind the scenes of the tour and told us what the squad was up to. Getting excited about this year's US tour? Well, there's not long to wait now. 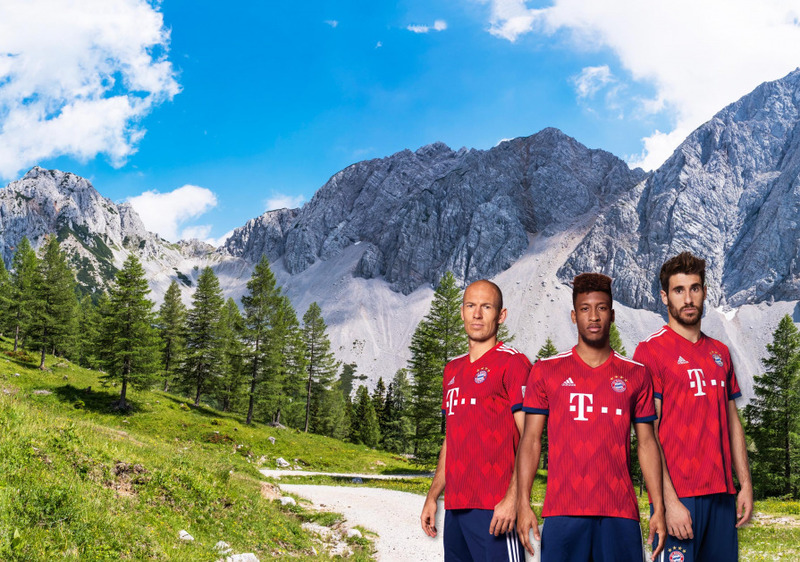 No sooner has the World Cup in Russia come to an end than preparations for the new season begin with the annual FC Bayern Audi Summer Tour. This time, the reigning Bundesliga champions will be making two stopovers in the USA: Philadelphia and Miami. In addition to various fan events and the training sessions, the program features two friendlies: on 25th July, FC Bayern will play Italian champions Juventus Turin in Philadelphia; three days later, on 28th July, they come up against English Premier League champions Manchester City in Miami. But before boarding their plane to America, the team under their new head coach Niko Kovac will be visiting Austria. Tomorrow (Saturday), FC Bayern will be playing their first preseason match against Paris Saint-Germain. And as is only right and proper, we will be bearing gifts. After each of these friendlies, DHL will be giving away a jersey worn by one of the players. In homage to the host country of this year's summer tour, FC Bayern's home ground - the Munich Allianz Arena - was lit up in the colors of the American national flag on 4th July, Independence Day. A spectacular sight! 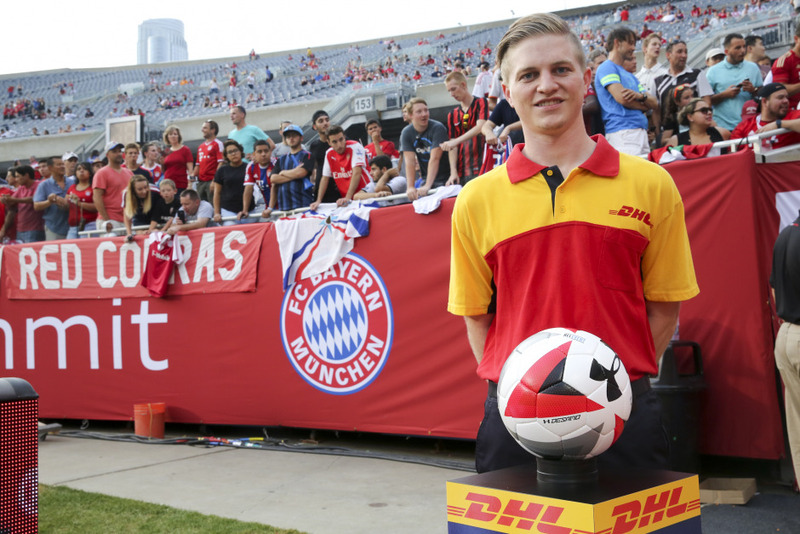 PS: Did you know that DHL became the official logistics partner of your favorite team at the start of the 2014/15 season? 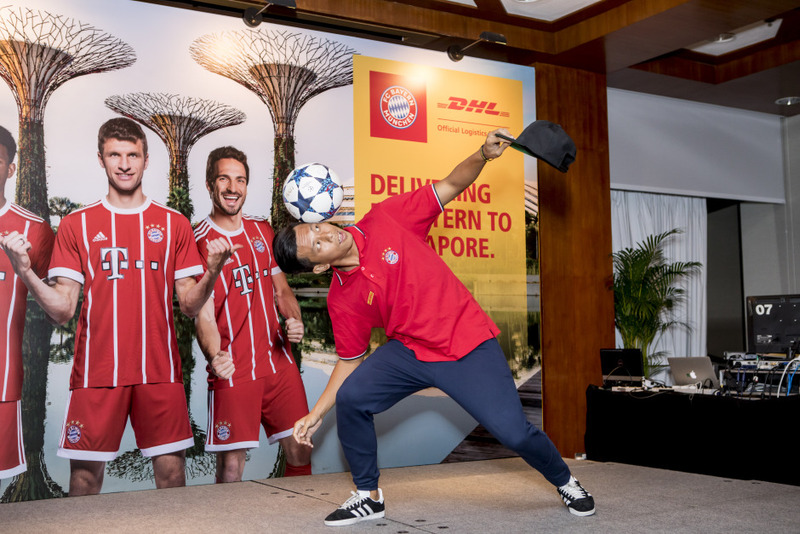 As logistics partner, DHL is responsible for the reliable delivery of FC Bayern merchandise to the team’s fans and for ensuring that the team’s equipment arrives on time for overseas matches. 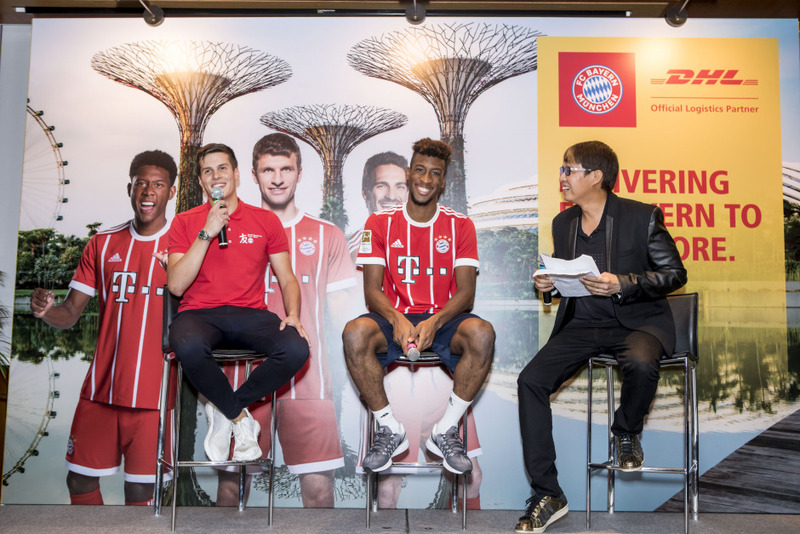 DHL eCommerce supports FC Bayern as its international partner for logistics and e-commerce solutions, which includes the establishment and operation of online fan shops in China. Mach mit: Werde einer von uns!